Since Data Standard 2014, a lot has been improved. The numbering, dynamic property, replace with copy, etc. With the new feature, new controls came in the dialog, which refers to DLLs. Such DLLs are needed in order to interpret the dialogs. So, if you open a Data Standard XAML file with Visual Studio, the designer will only be able to render the dialog if all DLLs are referenced. As recently this question come up several times, I thought it would be good to give you a summary. These are the DLLs that you’ll need in Visual Studio in order to properly edit a Data Standard XAML file. Some of these DLLs are needed for the File.XAML, some for the Inventor.XAML and other for the tabs. However, as you probably will edit all of them eventually, just add them to your Visual Studio project and start editing. Especially for the File.XML you will still see that the numbering scheme control throws an exception saying “Cannot create an instance of “DSNumSchemeCtrl”. Don’t worry about this. Visual Studio tries to instantiate such object and files. However, the dialog is visible and you can edit the XAML file. 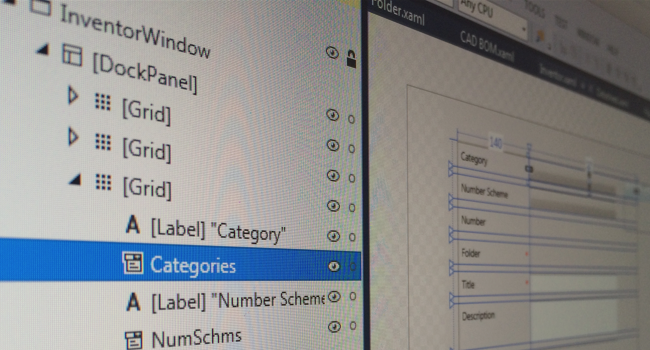 Visual Studio will immediately open two files (MainWindow.XML and MainWindow.xaml.cs). Close both files, as we don’t need them. I hope this little description will help you getting started with editing Data Standard dialogs.